What makes a Hot Air Balloon rise? Many people wonder what makes a hot air balloon fly? Its more than just hot air… or is it. Flying a hot air balloon is a very simple principal. We all know that heat rises. 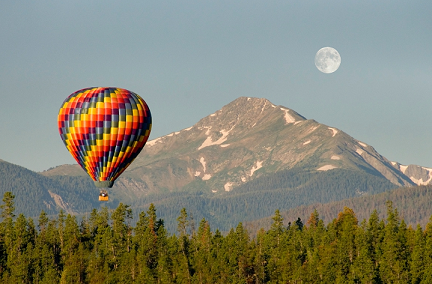 There are many components to a hot air balloon ride. First we us a nylon material that is coated with a sealant. All hot air balloons come form the manufacture with a sealant for the material. This sealant makes the fabric less porous for hot air to escape. When we begin the inflation process we start with with an inflation fan. The inflation fan blows ambient cool air into the envelope (colorful part) and the balloon begins to take shape. The certified, trained commercial pilot will inflate the envelope with 70% cold air. This step is done while the hot air balloon is on its side. Once the balloon envelope is round and has taken shape, He or she will fire up the burners and they will begin to add hot air into the envelope. 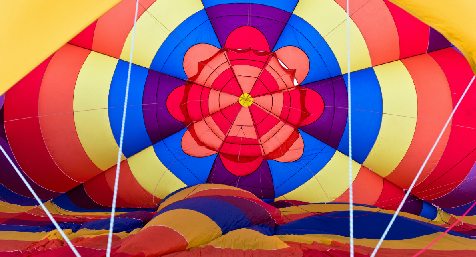 As the hot air is added to the balloon, the balloon will begin to rise up off of the ground. Once enough heat is added, the hot air balloon will stand strait up. It will be shortly after that, the pilot in command will ask the awaiting passengers to load up for their hot air balloon excursion. Many times people ask; How can you shoot flames into the hot air balloon without burning the fabric. The entire opening where the burners are located has a heat resistant fabric called Nomex. Its a denim feeling fabric that his heavy and it is very tough. Nomex can with stand lots of hot air and direct flames for short periods of time. The concept of hot air is that hot air rises and cold wants to find the lowest point it can. Cold air is just like water. So the pilot will add heat with the burner to increase the internal temperature of the hot air balloon. Making the internal temperature hotter than the air outside, will create lift with the hot air balloon. The more heat that the pilot adds, the faster it will go up. The more heat the pilot vents out of the balloon makes the hot air balloon go down. The pilot has multiple navigation lines he of she uses to turn the balloon, vent the balloon of the hot air to slowly go down. The pilot can also let the balloon naturally cool off internally, and it will slowly start its way back down to earth in a very controlled manner. There are different wind directions in the air and they have many different speeds at different altitudes. The commercial pilot will use these winds to navigate the hot air balloon during flight like a highly skilled sail boat captain with great precision. Want to know more about balloons? Subscribe to news letter and will will provide you with valuable facts about hot air balloon. Hot air balloons are more than just hot air! We look forward to sharing your memory with you. Remember you have a friend in the ballooning business! Serving the Phoenix Metropolitan Area including Scottsdale, Tempe, Mesa, Chandler, Gilbert, Anthem, Cave Creek, Carefree, Apache Junction areas. Also, Sedona and the high country in the northern part of the state.